Secretary of Commerce Wilbur Ross’ decision last week to add a controversial question on citizenship to the 2020 census came in the face of opposition from career officials at the Census Bureau who fear it will depress response rates, especially from immigrants. Two people with knowledge of the deliberations said career leaders in the Census Bureau, which is part of the Commerce Department, had scrambled to come up with alternatives to adding the question. Those efforts were unsuccessful. The Census Bureau recently noted greater fear and reluctance to fill out the survey in the current political climate. In a November presentation, a bureau official cited a recent increase in respondents expressing concerns about confidentiality of data related to immigration. It cited particular concerns among participants in what it labeled an Arabic focus group and among Spanish-speaking respondents. A Census spokesman referred questions to the Commerce Department. 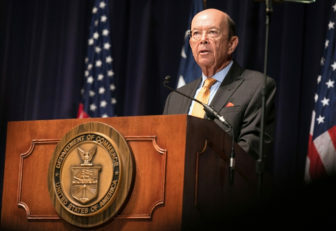 A Commerce spokesman said that Ross “took a hard look” at an alternative proposal by the Census Bureau to get citizenship data without adding the question. But he ultimately decided the proposed method “would provide an incomplete picture.” The Ross memo argues that the value of the data collected from the new question will outweigh any harm. ProPublica first reported in December that the Justice Department had submitted a last-minute request that the Census Bureau add a question on citizenship to the 2020 survey. The Justice Department argued that better data on citizens was needed to better enforce voting rights protections for minority groups. But civil rights groups and Democrats fear that the question will lower response rates, affecting congressional redistricting and distribution of federal dollars for a decade. It would be the first time since 1950 that the full, once-a-decade census asks people about their citizenship. The Constitution requires a count of all residents of the country every ten years. The Census Bureau conducts a separate detailed survey of a sample of U.S. households that includes questions about citizenship. The driving force behind the request for the new question, according to internal emails, was a Justice Department political appointee who spent years as an attorney in private practice defending GOP redistricting maps around the country. That raised even more concerns among civil rights groups that opposed the addition of a citizenship question. This story was first published March 27, 2018, by ProPublica, a Pulitzer Prize-winning investigative newsroom. Sign up for their newsletter.